Yorkshire’s largest independent vehicle-hire company is celebrating a 30-year business partnership with Harrogate-based, logistics and exhibition services firm, Fishers of Harrogate. Founded in 1988, Arrow Self Drive’s Knaresborough depot has supplied Fishers with 7.5 and 18 tonne trucks since its inception. Formerly operating as Ready Drive in Knaresborough, Arrow Self Drive is a family owned business providing car, van, minibus and truck rental services to businesses in Yorkshire. With a head-quarters in Huddersfield, the firm has other depots in Wakefield, Bradford, Sheffield, Leeds, Barnsley, Hull and Knaresborough. Established in 1981, Fishers of Harrogate is a third-generation family business, specialising in logistics, exhibition and storage services. Managing director, Alan Fisher, assumed his role in 2007, following his father, David Fisher’s retirement. When the two companies joined forces more than thirty years ago, they recognised a shared vision to build and maintain strong relationships with other Yorkshire businesses. 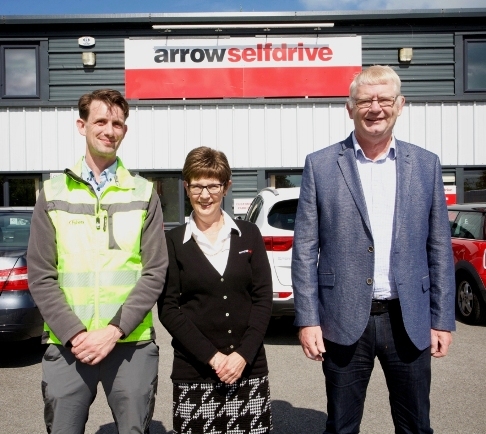 David Fisher said: “Over the years our business has changed quite considerably and Arrow Self Drive has been there to support us on our growth journey. At one time our main business was haulage and we used Arrow Self Drive for rentals of Sprinter vans and anything up to 7.5 tonnes. “In 2008 my son Alan got his Class 1 licence and we made a move towards hiring the bigger trucks up to 18 tonnes. By 2012 as our business grew and we moved into distribution and exhibitions and had more of a need for arctic trucks.